Synopsis: From prolific creators Ryan Murphy and Brad Falchuk, new procedural drama 9-1-1 is a fast-paced exploration into the lives and careers of first responders – cops, paramedics, firefighters – the people who put their lives on the line to save others. Starring Academy and Emmy Award nominee and Golden Globe winner Angela Bassett (“American Horror Story,” “What’s Love Got to Do with It”), the series is based on the real-life, high-pressure experiences of emergency response providers who are thrust into heart-stopping situations that are equal parts unpredictable, intense and uplifting. These emergency responders must try to balance saving those who are at their most vulnerable with solving the problems in their own lives. Emmy Award- and Golden Globe-nominated actor Peter Krause (“The Catch,” “Six Feet Under”) and Emmy Award-nominated actress Connie Britton (“Nashville,” “Friday Night Lights,” “American Horror Story”) have been cast in lead roles. Oliver Stark (“Into The Badlands”), Aisha Hinds (“Shots Fired,” “Underground”), Kenneth Choi (“The People v. OJ Simpson: American Crime Story”) and Rockmond Dunbar (“Prison Break,” “The Path”) have been cast in series regular roles. The series will premiere in 2018. 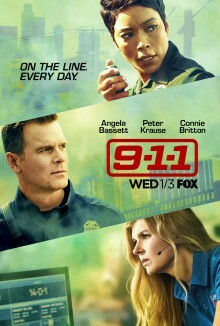 Join LatinoScoop at an exclusive advance screening of 9-1-1 in select locations below. Click on the link below for your city and enter the code. If you download a screening pass and aren’t able to use it, please share it with someone who can attend. There are limited number of passes available for each location. Screening passes are available on a first-come, first-serve basis. Additional passes will not be added once they are all redeemed. All advance screenings will take place on Wednesday, December 13. Anyone downloading a screening pass is advised to arrive early to secure seating. The theater is intentionally overbooked by the studio to ensure a full house. Plan accordingly to arrive with enough time.